White Out Rose Shrubs are the latest rose bush introduction from Bill Radler, who redefined disease resistance and flowering of roses. Rosa White Out provides contrast between the deep dark, almost blackish foliage and the abundance of cream white flowers is striking. 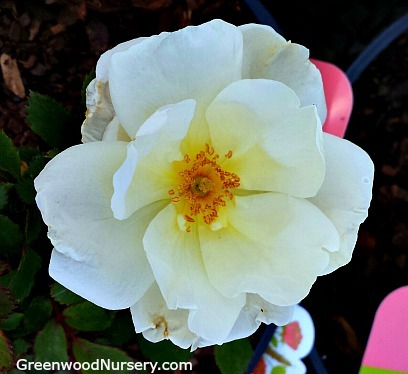 Very compact shrub and extremely disease resistant, it is the closest thing to a Knock Out® Rose, and by far the best white flowering shrub rose on the market today. The Rosa White Out™ Rose blooms from early spring to late fall, and require no special care to grow. Used individually, in mixed borders, mass plantings, hedge plantings, foundation planting, in perennial plant gardens or even containers, this trouble free shrub rose suits any lifestyle. As seen featured in Better Homes and Gardens, Southern Living, and Martha Stewart Magazines. White Out™ Rose is from the creator of the Knock Out® Roses. While it is not a Knockout Rose, the White Out™ Rose will still become a beautiful part of your garden.